Albemarle County is actively working to transform the Route 29/Rio Road area, work that started with the new grade separated interchange project and is continuing with a small area plan that will re-imagine how people live, work, shop and play in this critical area of the County. In this podcast, the County solicits the thoughts and ideas of seniors as it begins to finalize the plans for this vital area of the county. Topics include: Current Rio+29 Small Area Plan, the Economic Development in the Rio+29 area and the development of transportation facilities for bicycles, pedestrians, transit, and cars. Listen to the speakers via the podcast and watch the slides shown. 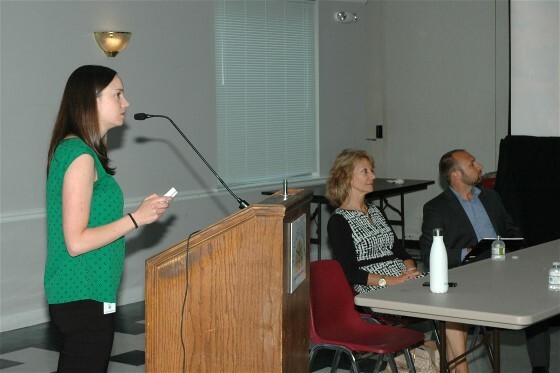 Presentations were made by Rachel Falkenstein (left), Albemarle County Senior Planner, Lee Catlin, Assistant County Executive, and Kevin McDermott, Principal Planner for Transportation. Lee Catlin spoke first on economic development in the county, how new businesses are attracted, and facilitating the growth of current businesses. There was a discussion of improving the corridors for cars, bikes, pedestrians and transits lead by Kevin McDermott. Rachel Falkenstein discussed amenities, land uses, urban forms and features of the area. In addition to leading the discussion, Supervisors Diantha McKeel, Chair of the Board and Supervisor for the Jack Jouett District, and Brad Sheffield, Supervisor for the Rio District, also answered questions from the audience. 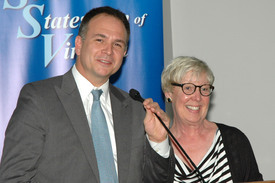 The program was moderated by SSV Vice President Rich DeMong.